Displaced people have a hard time finding employment. Five hundred thousand refugees are currently on the job market — and prospects look bleak. A Munich startup has founded a nonprofit temping agency. 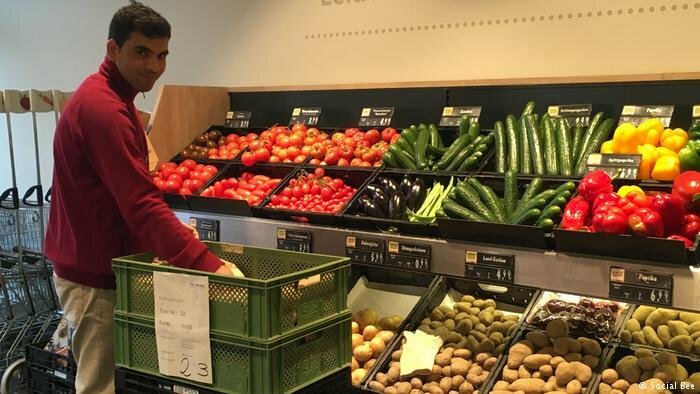 Many of the vegetables that Masood Sutanzadeh sets out for shoppers at an organic supermarket in the Munich metropolitan area were unknown to him before he came to Germany from Afghanistan. The 24-year-old is improving his language skills by conversing with customers. "My goal is very simple," Sutanzadeh said. "I want to have a normal life. All that matters to me is that there is a safe environment." In Afghanistan, he had worked as an electrician for the US Army, which made him a Taliban target. In 2015, he decided to flee and came to Germany via Iran, Turkey and the Balkans. Within days of his arrival, he registered for a German course. A year later he began applying for jobs. It quickly became apparent how difficult it would be for him to gain a foothold in the labor market. "Now and then, I received letters of rejection, but mostly I got no answer," Sutanzadeh said. In fact, he was only able to get his job at the market through the persistence of a Munich startup. "Social-Bee has given me a chance," Sutanzadeh said. Maximilian Felsner and Zarah Bruhn founded Social-Bee after deciding that they could not stand by and watch while hundreds of thousands of refugees were excluded from Germany's labor market. They wanted to hear success stories for a change, and developed the idea of a "nonprofit temping agency" as a bridge to the labor market. "We hire refugees and asylum-seekers to work for us, and then later transfer them on to partner companies," Felsner said. Workers also receive socio-pedagogical support, language development and other further training. In addition, they receive a regular salary from the startup company, which the founders intend to finance in the medium term through transfer fees, but which is currently covered by charitable foundations. The goal, Felsner said, is for Social-Bee employees to eventually be hired on to the staff of partner companies. The big advantage, he said, is that "we can remove all the bureaucratic hurdles for companies beforehand and deal with the asylum issues that often arise all at the same time." Some companies have already been won over. Partner companies include well-known firms such as Aldi, Würth, Zeppelin and Sys Microtech, as well as small and midsize companies from the greater Munich area. "Many are discouraged by the bureaucracy and often don't really know how they could employ refugees and asylum-seekers," Felsner said. Misunderstandings can arise. Managers often believe that they will be hiring someone who is extremely grateful for the employment and will adapt to it speedily. If things turn out differently, interpersonal conflicts can quickly arise, he said: "On the one hand, we act as a buffer, preparing refugees for such situations and, on the other hand, we help companies to understand the employees properly." As a nonprofit, Social-Bee's earnings flow back into its work — and thus back into supporting job seekers. The startup has so far had more than 50 employees under contract. More than a dozen of them have already been successfully placed in permanent positions. Felsner expressed optimism that the startup would continue to expand. "By the end of the year, we want to have 100 employees — including in other cities," he said. If everything goes according to plan, up to 1,000 displaced people will transitions from employment via Social-Bee to permanent positions with the companies that have contracted them in the next three years. So far, the plan has been working, Felsner said: "More than 90 percent of the employees who have worked for us are now in permanent positions, have started training or have begun studying." Sutanzadeh is certainly happy tell others who are in the situation he was in about Social-Bee. "I feel like I'm part of a real family here," he said. The next plan is to take the service nationwide. The founders have come up with the idea of an information campaign to make companies less reserved about hiring people such as Sutanzadeh. The campaign's message is that people who have managed to undertake the dangerous migration to Europe should have the skills to enter Germany's workforce. 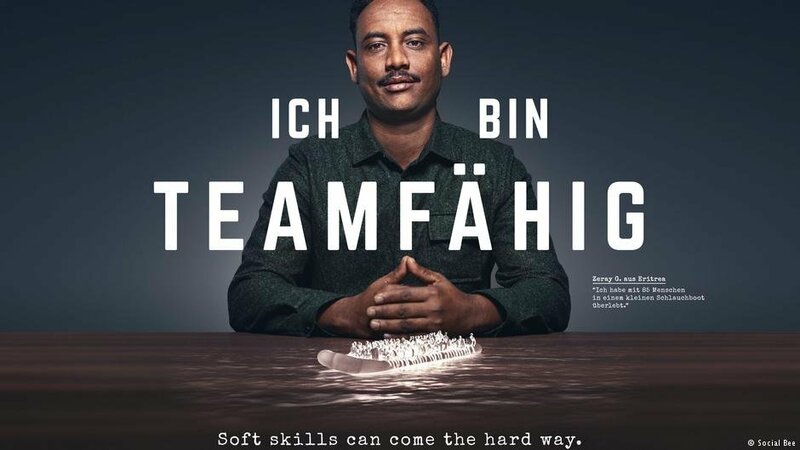 "I survived with 85 people in a small dinghy," says a promotional poster featuring Zeray from Eritrea. "I'm a team player." This directly targets prevalent prejudices in many Germany human resources departments and is intended to send the clear signal that displaced people ought not to be automatically discounted as weaker candidates on the job market. "What someone has been through can become a strength," Felsner said. Sutanzadeh is an example of this. He has already overcome many hurdles in finding work and arriving in a new culture. However, he still faces a legal obstacle: For several months now, he has been under the threat of deportation after his application for asylum was rejected. "I couldn't sleep at night without the people from Social-Bee," Sutanzadeh said. His work at the organic supermarket helps him keep going. Whatever happens, he added, it was worth it to come to Germany.